Co-Ordnance – This project aimed to be a local business tracker. They wanted to make the London Stock Exchange code into meaningful data, but alas, the stock exchange prevents scraping. So they decided to use company data from registers like the LSE and Companies House to extract business information and structure it for small businesses who need to know best place to set up and for local business activists. 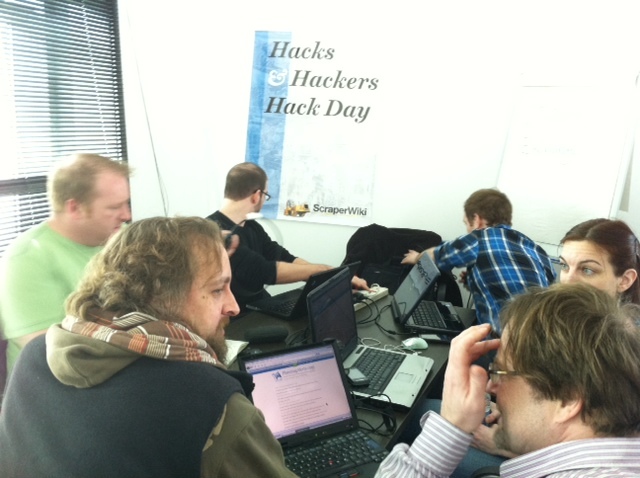 The team consisted of 3 hacks (Steve Fossey, Eva Tallaksen from Intrafish and Gareth Morlais from BBC Cymru) and 3 hackers (Carey Hiles, Craig Marvelley and Warren Seymour, all from Box UK). It’s a good thing they had some serious hackers as they had a serious hack on their hands. Here’s a scraper they did for the London Stock Exchange ticker. And here’s what they were able to get done in just one day! This was just a locally hosted site but the map did allow users to search for types of businesses by region, see whether they’d been dissolved and by what date. Open Senedd – This project aimed to be a Welsh version of TheyWorkforYou. A way for people in Wales to find out how assembly members voted in plenary meetings. It tackles the worthy task of making assembly members voting records accessible and transparent. The team consisted of 2 hacks (Daniel Grosvenor from CLIConline and Hannah Waldram from Guardian Cardiff) and 2 hackers (Nathan Collins and Matt Dove). 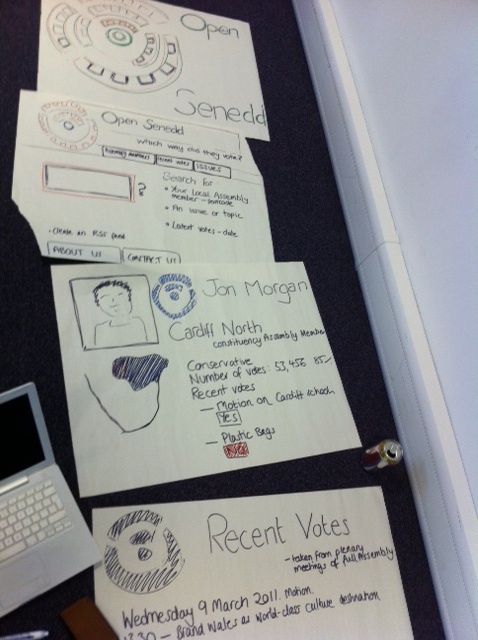 They spent the day hacking away and drew up an outline for www.opensenedd.org.uk. We look forward to the birth of their project! Which may or may not look something like this (left). Minus Coke can and laptop hopefully! They took on a lot for a one day project but devolution will not stop the ScraperWiki digger! There’s no such thing as a free school meal – This project aimed to extract information on Welsh schools from inspection reports. This involved getting unstructure Estyn reports on all 2698 Welsh schools into ScraperWiki. 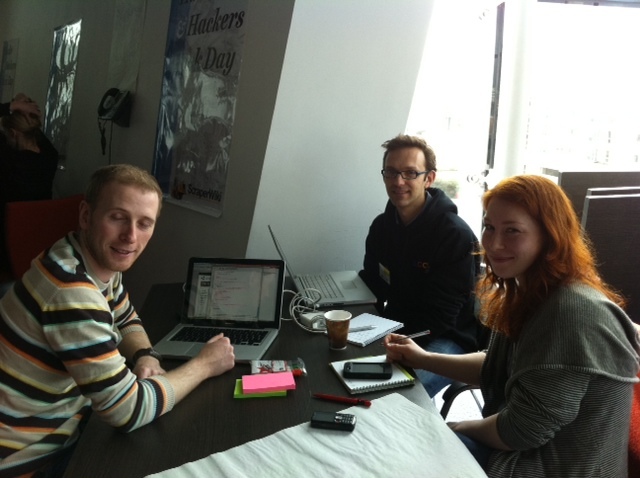 The team consisted of 1 hack (Izzy Kaminski) and 2 astronomer hackers (Edward Gomez and Stuart Lowe from LCOGT). 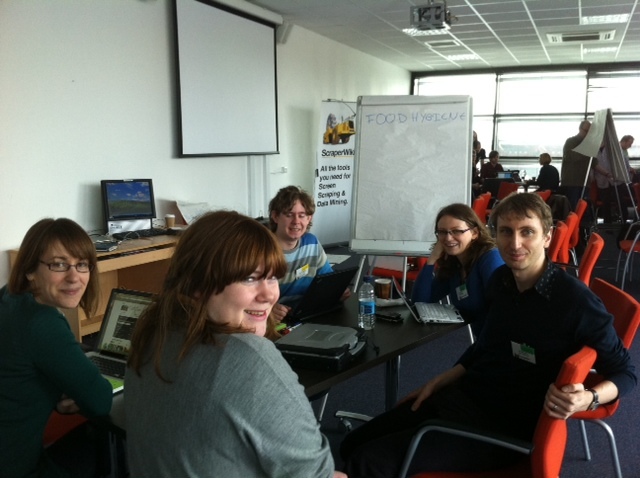 This small team managed to scrape Welsh schools data (which the next team stole!) 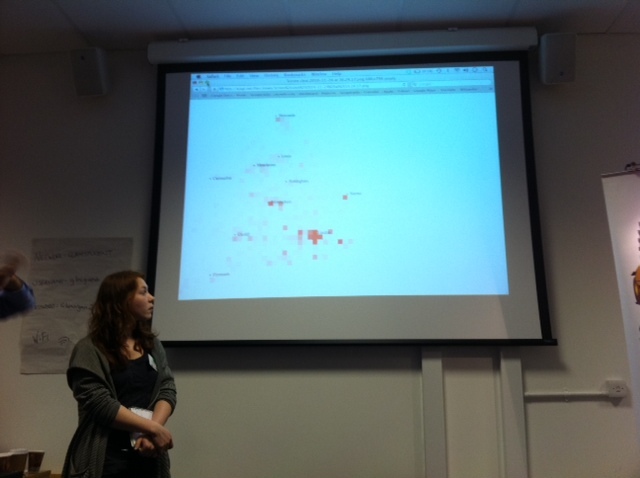 and had time to make a heat map of schools in Wales. This was done using some sort of astronomical tool. Their longer term aim is to overlay the map with information on child poverty and school meals. A worthy venture and we wish them well. Ysgoloscope – This project aimed to be a Welsh version of Schooloscope. Its aim was to make accessible and interactive information about schools for parents to explore. It used Edward’s scraper of horrible PDF Estyn inspection reports. These had different rating methodology to Ofsted (devolution is not good for data journalism!). 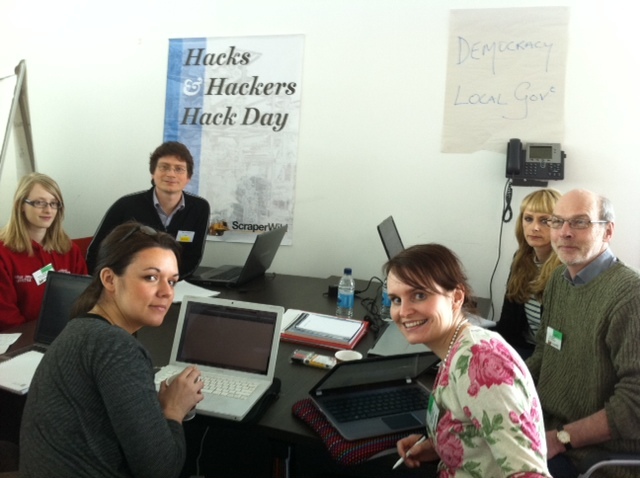 The team consisted of 6 hacks (Joni Ayn Alexander, Chris Bolton, Bethan James from the Stroke Association, Paul Byers, Geraldine Nichols and Rachel Howells), 1 hacker (Ben Campbell from Media Standards Trust) and 1 troublemaker (Esko Reinikainen). Maybe it was a case of too many hacks or just trying to narrow down what area of local government to tackle, but the result was a plan. Here is their presentation and I’m sure parents all over Wales are hoping to see Ysgoloscope up and running. 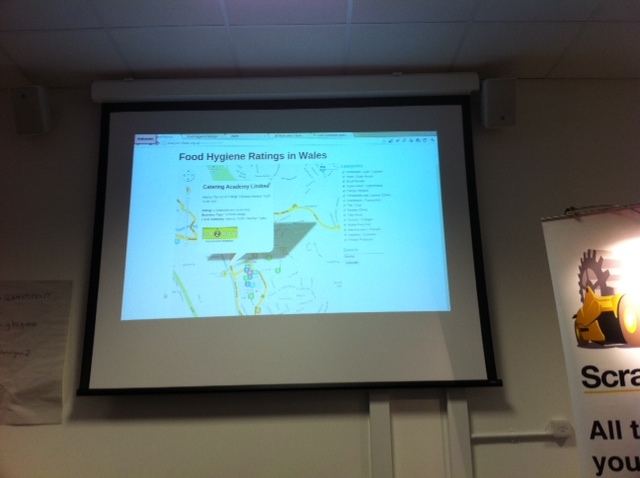 Blasus – This project aimed to map food hygiene rating over Wales. They wanted to correlate this information with deprivation indices. They noticed that the Food Standards Agency site does not work. Not for this purpose which is most useful. 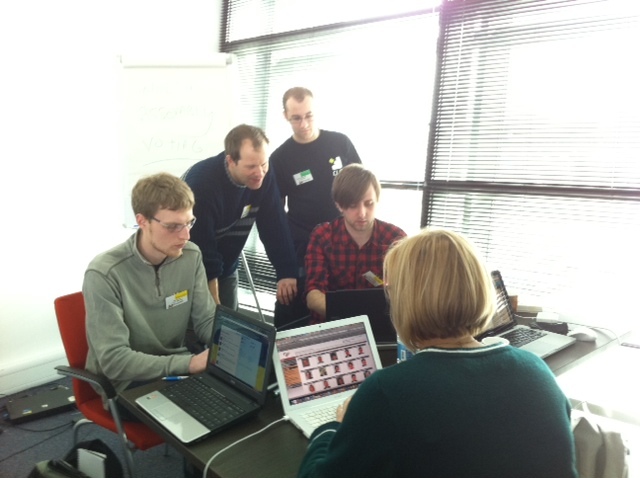 The team consisted of 4 hacks (Joe Goodden from the BBC, Alyson Fielding, Charlie Duff from HRZone and Sophie Paterson from the ATRiuM) and 1 hacker (Dafydd Vaughan from CF Labs). As you can see below they created something which they presented on the day. They used this scraper and made an interactive map with food hygiene ratings, symbols and local information. Amazing for just a day’s work! To our judges Glyn Mottershead from Cardiff School of Journalism, Media and Cultural Studies, Gwawr Hughes from Skillset and Sean Clarke from The Guardian. And our sponsors Skillset, Guardian Platform, Guardian Local and Cardiff School of Journalism, Media and Cultural Studies. 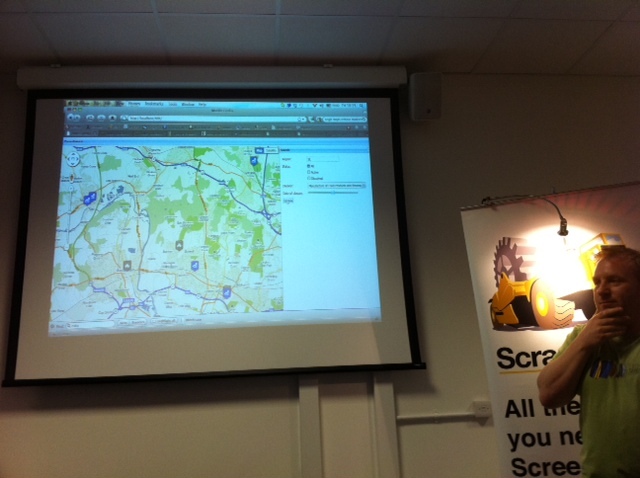 Schools, businesses and eating place of Wales – you’ve been ScraperWikied! 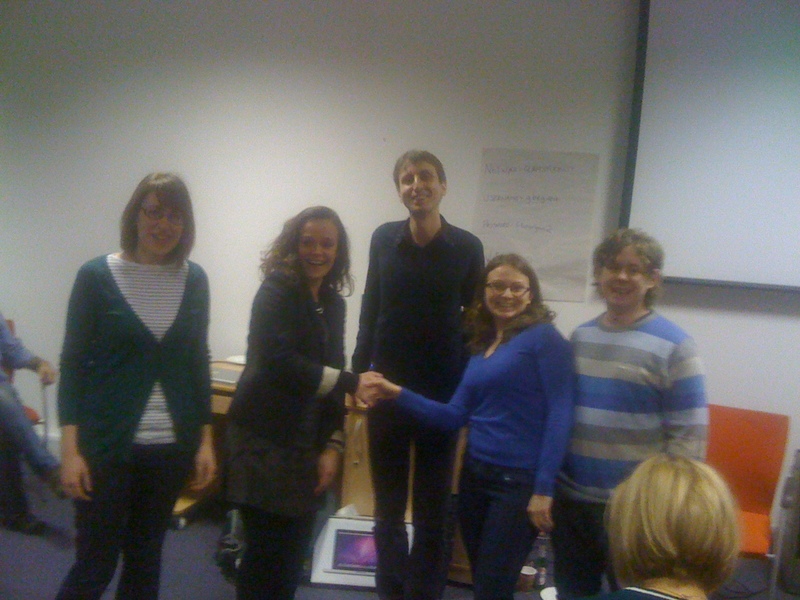 Blasus winning first prize and Best Scoop award (prizes will be delivered, sealed with a handshake from our sponsor). Tags: Alyson fielding, ATRiuM, BBC Cymru, BBC Wales, Ben Campbell, Bethan James, Box UK, business, Cardiff, Cardiff School of Journalism, Carey Hiles, CF Labs, Charlie Duff, Chris Bolton, CLICOnline, Craig Marvelley, Dafydd Vaughn, Daniel Grosvenor, Edward Gomez, Esko Reinikainen, Estyn, Eva Tallaksen, food, Gareth Morlais, Geraldine Nichols, Glyn Mottershead, guardian, Guardian Cardiff, guardian local, guardian open platform, Gwawr Hughes, hacks and hackers hack day, Hannah Waldram, HRZone, Intrafish, Izzy Kaminski, Joe Goodden, Joni Ayn Alexander, LCOGT, Matt Dove, Media Standards Trust, Nathan Collins, Paul Byers, Rachel Howells, school, Schooloscope, scrapers, scraperwiki, scraping, Sean Clarke, Sophie Paterson, Steve Fossey, Stroke Association, Stuart Lowe, TheyWorkforYou, Warren Seymour, What's occurin'? ← See a scraper you like? Fork it! Great summary Nichola. Thanks to ScraperWiki for organising the day and for making everyone feel so welcome. Sorry, I misspelled your name Nicola.